Arrow Scientific offers their range of thermal processing machinery ideal for the beverage industry. Designed with Bottom Line Process Technologies (BTL), the range consists of beverage testing equipment, Hot Fills and High Temperature Short-Time (HTST) machineries. BTL specialises in designing and manufacturing small-scale beverage equipments and other bench top machineries. Arrow Scientifics’ thermal processing machinery range includes standard HTST units available to provide beverage manufacturers and ingredient suppliers efficient and simple operations in producing beverage samples under controlled conditions. 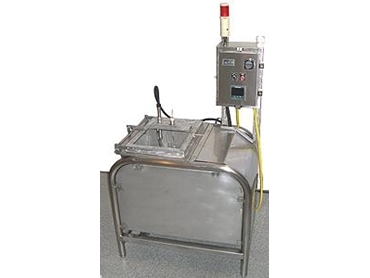 The beverage laboratory Hot Fill (HTST) Pasteurisers are made from stainless steel construction and includes bottle filler box for safety, hot water heater with digital controller, variable speed product pump, digital product temperature display and a water container with auto refill for start up and flush. The BLT Batch Bottle Pasteurisers are able to heat and cool filled bottles of beverages to exact specifications. This beverage equipment can process a wide variety of beverages including juices, tea, milk and milk products, alcoholic and non-alcoholic beverages, energy drinks and flavoured waters. The BLT Batch Bottle Pasteurisers automatically fills, pasteurises and cools the down the bottled beverages. The beverage equipment has a nominal capacity of 15 to 20 bottles (350mL), as well as an alarm that rings for every cycle completion. The BLT Batch Chillers are designed to cool bottles efficiently to help create consistent processing results. The BLT Batch Chillers include a stainless steel sink and a water chilling unit.